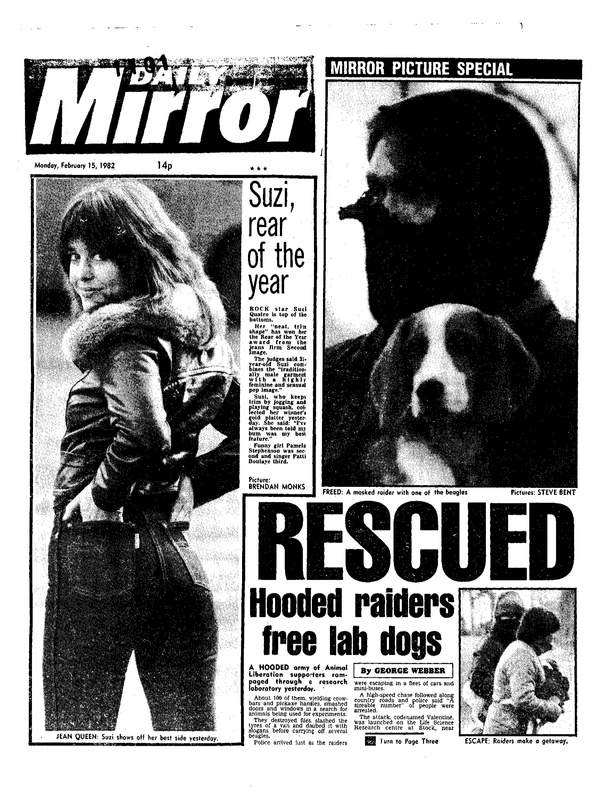 'Rescued: Hooded raiders free lab dogs' Daily Mirror February 15, 1982. Thirty years ago this month (February 15, 1982 to be precise) the Daily Mirror published this historic front page. A hooded army of Animal Liberation supporters rampaged through a research laboratory yesterday. About 100 of them, wielding crowbars and pickaxe handles, smashed doors and windows in a search for animals being used for experiments. They destroyed files, slashed the tyres of vans and daubed it with slogans before carrying off several beagles. Police arrived just as the raiders were escaping in a fleet of cars and mini-buses. A high-speed chase followed along country roads and police said “A sizeable number” of people were arrested. The attack, codenamed Valentine, was launched on the Life Science Research centre at Stock…. Operation Valentine targeted Life Science Research Laboratories in Stock, which is near to Chelmsford in Essex, England. Several more people have now been charged with conspiracy to cause criminal damage following the ALF raid on Life Science Research Laboratories at Stock, Essex on February 14th. The number charged is now 29. Several of them are also likely to face additional charges of damaging the fence surrounding the laboratory, breaking windows and theft and handling of beagles. This is a particularly disturbing case because peaceful demonstrators have been charged with conspiracy to cause criminal damage, thus severely threatening our right to demonstrate. In a large scale day-light raid, codenamed “Operation Valentine” (the date was 14 February), dozens of activists stormed the Life Science Research labs at Stock, Essex, while a demo went on outside. A variety of animals were rescued, £76,000 damage was caused and 60 people arrested. Eight activists were later sent to prison for their part in the raid. Operation Valentine attracted a great deal of publicity, caused considerable loss to Life Science (40 of their employees were laid off) and won many new recruits for direct action – but it was to be the last large scale ALF daylight raid. In retrospect there seemed to be no advantage in carrying out such an action in daylight, the extra publicity evident that, when serious damage occurred, it was much more difficult for activists to pretend that they were just part of the peaceful demonstration – indeed, in the “Valentine” case, several of the peaceful demonstrators ended up charged with conspiracy. I find Singer’s opinion here interesting. I agree that there exists no real advantage to carrying out such an action in daylight, since the point of such an action lies in rescuing the animals. But, unfortunately he confuses the matter. Though property damage did occur, no *maiming* whatsoever seems to have occurred. So, almost surely, no real harm occurred. Was not real good done here also?